The Glenwood Vaudeville Revue is a two hour family fun dinner theater show (dinner not included in cost of tickets) with professional talent performing a variety of comedy skits, jokes, high energy dance numbers, unique novelty songs and original comedic presentations that are guaranteed to entertain, and help you laugh your worries away! All of our shows are entertainment at its finest and have received great reviews; and this year is sure to please young and old alike. As usual, this summer we have new and original material including: An all New Rap, Gary's Dramatic Readings, More Babies and all New Jokes, Gags, Skits and Bits. The Glenwood Vaudeville Revue is a two hour family fun dinner theater show (dinner not included in price of this ticket) with professional talent performing a variety of comedy skits, jokes, high energy dance numbers, unique novelty songs and original comedic presentations that are guaranteed to entertain, and help you laugh your worries away! Adult ticket for show only. Doors open at 5:00pm for dinner, with show following after a la carte food service. 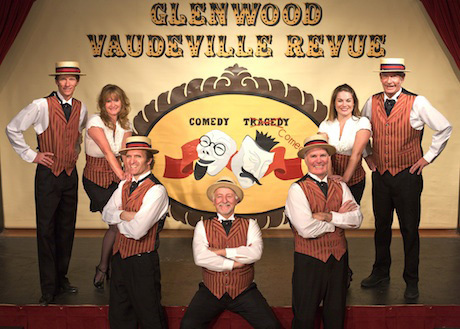 The Glenwood Vaudeville Revue is a two hour family fun show with professional talent performing a variety of hilarious skits, jokes, high energy dance numbers, unique novelty songs and original ideas that are guaranteed to make you laugh your worries away. In our show this summer, John and the talented cast have put together some of their best material to bring you a wonderful variety of comedy, song and dance numbers that will have you saying, "Wow! I've never seen that before". Come out and have a great time! Food and beverages available for additional cost at venue. Doors open at 6:00 for dinner with show following after food service. The Glenwood Vaudeville Revue is a two hour family fun dinner theater show (dinner not included in price of ticket admission) with professional talent performing a variety of comedy skits, jokes, high energy dance numbers, unique novelty songs and original comedic presentations that are guaranteed to entertain, and help you laugh your worries away! Children Ticket (2-12 yrs old) ticket for show only. Children Ticket (2-12 yrs old) for show only. Senior ticket for show only. Cancellation | Inside of 24 hours prior to arrival non-refundable. Other | Full payment due at booking. Inside of 24 hours prior to arrival non-refundable.